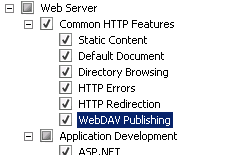 The <authoring> element specifies the site-level settings for WebDAV. The most important of these settings is whether WebDAV authoring is enabled for the site. Additional elements define the behavior for the WebDAV module, such as compatibility options and how the WebDAV module works with properties, locks, and the underlying file system. IIS 10.0 The <authoring> element was not modified in IIS 10.0. 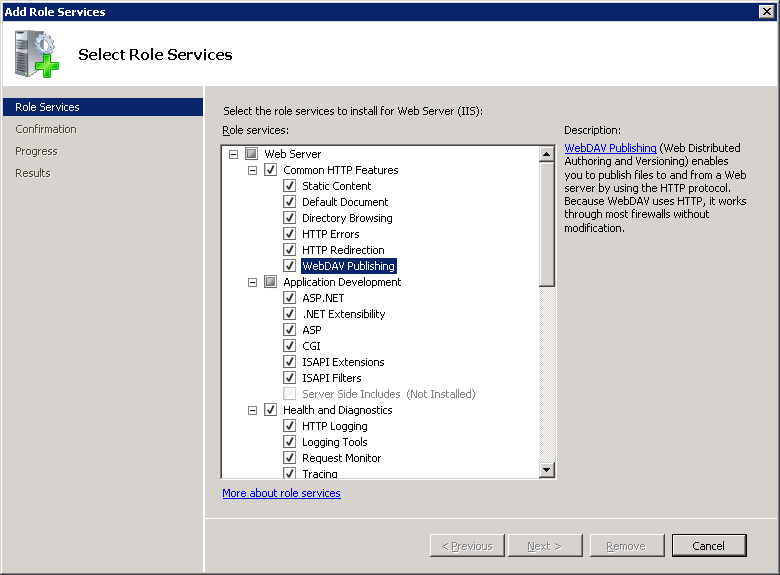 IIS 8.5 The <authoring> element was not modified in IIS 8.5. IIS 8.0 The <authoring> element was not modified in IIS 8.0. 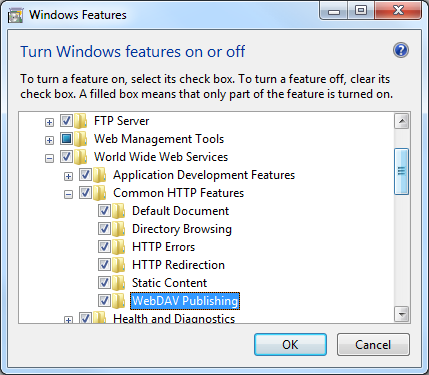 IIS 7.5 The <authoring> element ships as a feature of IIS 7.5. 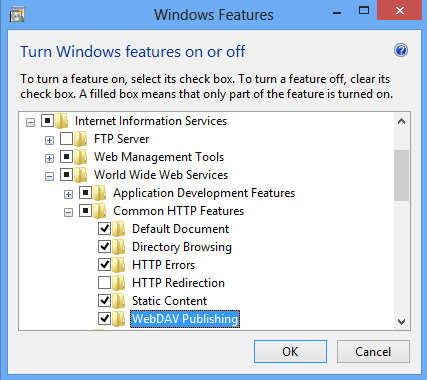 IIS 7.0 The <authoring> element was introduced in WebDAV 7.0, which was a separate download for IIS 7.0. 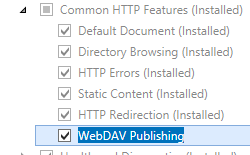 In the Connections pane, expand the server name, and then go to the site, application, or directory where you want to enable WebDAV publishing. 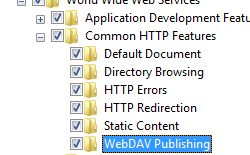 In the Home pane, double-click WebDAV Authoring Rules. 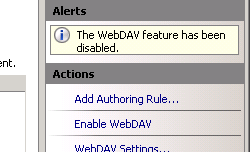 In the Actions pane, click Enable WebDAV. 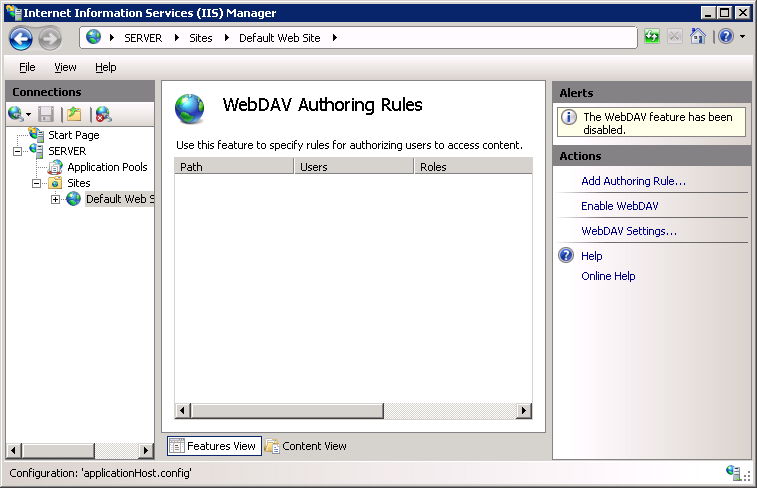 Once you have enabled WebDAV publishing, you will need to add authoring rules before users or groups can publish content to your server. For more information about how to create authoring rules, see the authoringRules topic. The <authoring> element is configurable only at the site level in the ApplicationHost.config file. Any <authoring> elements at other levels or in Web.config files are ignored. Specifies the compatibility options for WebDAV. 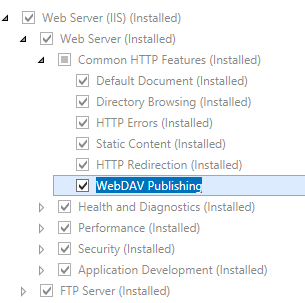 There are several behaviors that were used in previous versions of Microsoft's WebDAV implementations, and the flags in this attribute specify which of those behaviors the new WebDAV module will implement. The compatFlags attribute can have one or more of the following possible values. If you specify more than one value, separate them with a comma (,). The default value is MsAuthorVia, MultiProp, CompactXml, IsHidden, IsCollection. No compatibility options should be used. 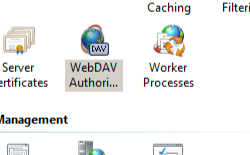 Specifies whether the WebDAV module should return the "MS-Author-Via" header to WebDAV clients. Note: Some WebDAV clients expect this header. Specifies whether multiple <prop> statements should be allowed in WebDAV requests. Note: This violates RFC 4918, but some earlier WebDAV implementations supported this syntax. Specifies whether the XML that is returned by the WebDAV module should be formatted hierarchically. Note: Normally the WebDAV module will simply return XML responses with no CRLF characters and no indentation. This cuts down on the size of the data that is transmitted over the wire, but it's very difficult to read without an XML parser. Specifies that the IsHidden pseudo-live property should be supported. Note: This property is an informal standard that is not defined in RFC 4918. Specifies that the IsCollection pseudo-live property should be supported. The numeric value is 16.
true if WebDAV authoring is enabled; otherwise, false. Specifies the maximum length, in bytes, of the request XML body for WebDAV requests. Note: This attribute was added in WebDAV 7.5 and IIS 7.5. The default value is 1000000.
true if SSL is required for WebDAV authoring; otherwise, false. Requiring SSL for WebDAV authoring adds an additional layer of security, but adds to the processing overhead for each request. Specifies how the WebDAV module interacts with the underlying file system. Specifies the WebDAV locking settings. properties Optional element. Specifies the WebDAV property settings. 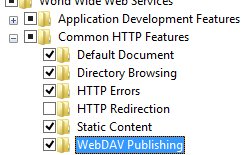 The following example lists a sample <webdav> element for the Default Web Site. This example clears any existing authoring rules, adds a single rule for the administrators group, enables WebDAV authoring, specifies that hidden files are allowed, enables WebDAV locks and specifies the lock provider, and enables WebDAV properties and specifies the default XML namespace for property mapping. 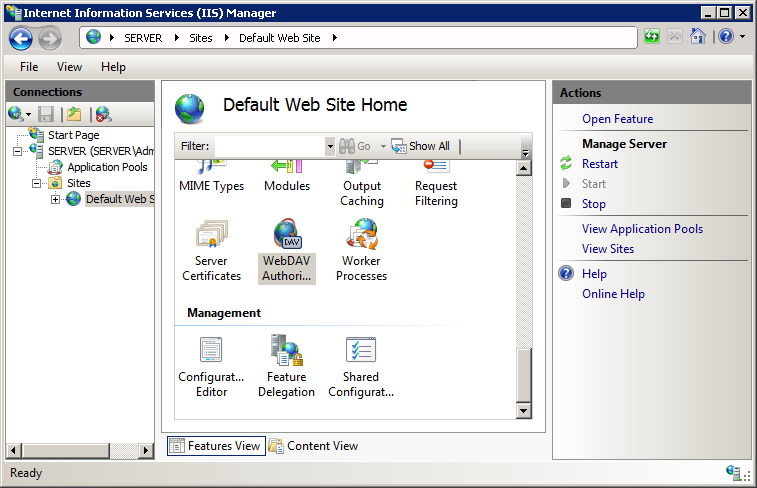 The following examples enable WebDAV authoring for the Default Web Site, and configure the site so that SSL is not required for WebDAV authoring. The following examples enable WebDAV locks for the Default Web Site by using the simple lock provider, and configure the site so that locks are not required for WebDAV authoring. The following examples configure the WebDAV property settings so that both anonymous and infinite depth property queries are disabled, and enable custom properties with the default XML namespace mapped to the built-in webdav_simple_prop provider.